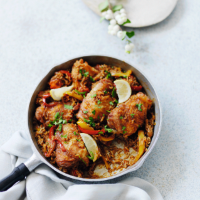 This spicy African-style dish contains nutty-flavoured wholegrain rice, which makes a nice change from white basmati, and is bound to be popular with the whole family. 1. Heat the sunflower oil in a large deep frying pan and gently cook the chicken for 15 minutes until the skin is crisp and golden. Transfer to a plate and set aside. 2. Add the onion to the pan and cook for about 5-6 minutes until beginning to soften and turn golden. Stir in the garlic, allspice, ginger, coriander and cayenne and cook for just a minute longer. 3. Stir in the tomato purée and cook for 1 minute, then add the peppers, tomatoes, rice and stock. Cover with the lid and simmer for 30 minutes, then return the chicken to the pan and cook for a further 10-15 minutes or until the rice is tender and the chicken is completely cooked through with no pink meat. Sprinkle over the parsley and serve with the lemon wedges to squeeze over. If serving this dish to young children, swap the cayenne pepper for sweet smoked paprika.